Genetics: Blue Dream is a cross of Blueberry and Super Silver Haze. Blue Dream is a sativa-dominant hybrid strain originally from Santa Cruz County, California. 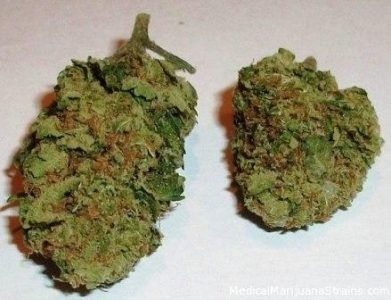 It is one of the most well-rounded and highly popular strains. Flavor & Aroma: Blue Dream features a sweet, blueberry aroma and taste. Effects: Blue Dream balances a pleasant, relaxing body buzz, and a cerebral euphoric high. Medicinal Uses: On the medical side, Blue Dream has been said to decrease minor pain and migraine headaches, as well as treat anxiety, depression and nausea. Potency: THC levels range between 15 - 25%. CBD levels usually come in at 0.1 - 0.2%. Grow Info: 8 week flowering time yields above average.